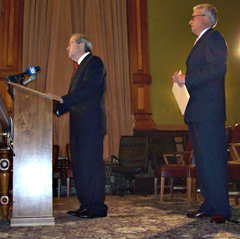 Terry Branstad talks as Auditor David Vaudt stands behind him. Republican State Auditor Dave Vaudt has endorsed Terry Branstad’s bid for a fifth term as governor. Branstad, a former governor, is competing against business consultant Bob Vander Plaats and State Representative Rod Roberts Vaudt for the Iowa G.O.P.’s 2010 nomination for governor. Vaudt met with each candidate, but he says none of them — including Branstad — directly asked for his endorsement. “I took the independent approach of evaluating each candidate and selecting the candidate I thought was best qualified in leading Iowa in this very challenging time,” Vaudt says. Branstad acknowledges that in his early years as governor when Democrats led the legislature there were some “valid criticisms” of his spending practices, but Branstad says those were corrected by budgeting reforms which were passed in 1992. 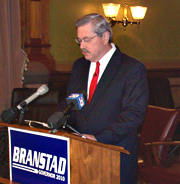 Branstad was Iowa’s governor for 16 years — from January of 1983 ’til January of 1999.